Our Rodeo Reindeer ride is a humorous festive alternative to a Rodeo Bull. Complete with his festive Santa hat and flashing red nose our Rodeo Reindeer is the ultimate entertainment for all Christmas Parties. 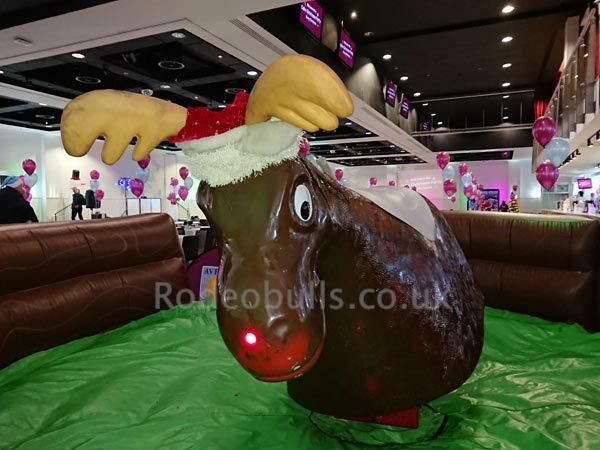 The Rodeo Reindeer uses the same motion unit and control panel as the Rodeo Bull so the speed of ride can be controlled from 'Docile Dancer' to 'Rampant Rudolph' level! Again the duration of the ride is automatically timed and shown on the large display panel and a trophy is provided for the longest ride of the event. The ride requires an area of 17x17ft and height clearance of 9ft. All doorways, passages, lifts, etc must have a minimum width of 33inches for the equipment to pass through. If the venue is not on the ground floor a lift must be available. If you have any queries concerning hire, then please don't hesitate to call or contact us and we will be pleased to assist you.